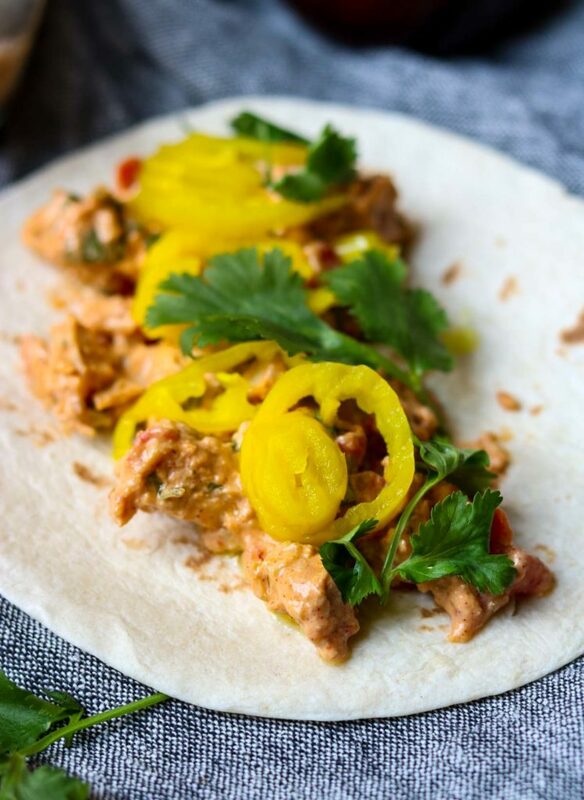 Creamy Chicken Tacos are my new favorite chicken taco! Tender pieces of cooked chicken get mixed into a creamy sauce full of Mexican seasonings & spices, tomatoes & chilies, fresh herbs, and cheese. 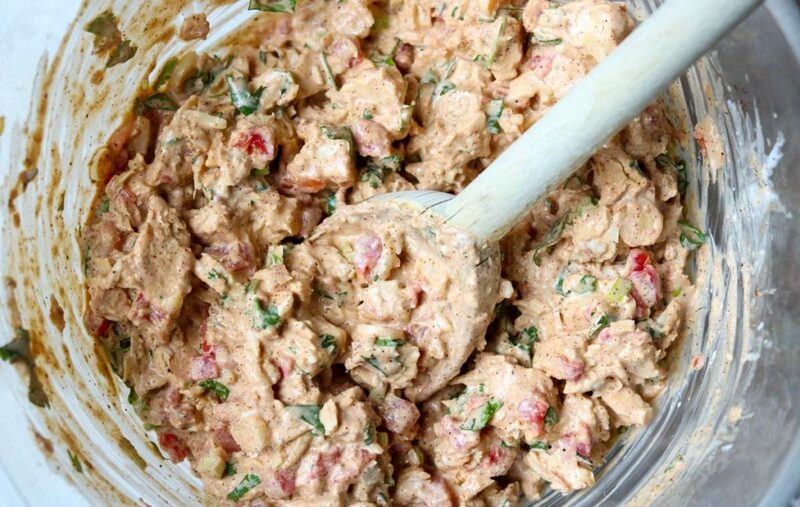 Simply pop that delicious chicken mixture into the oven for 20 minutes and it comes out ready to serve, just add some toppings, and warm tortillas. Don’t forget the chips and salsa! The creamy sauce for the Chicken Tacos is a mix of Greek yogurt, a touch of mayonnaise, and some shredded pepper jack cheese. You will not be standing over the stove making some complicated cream sauce for this recipe. I keep it nice and simple…. and delicious. It is semi-guilt-free (though I will say my food guilt gauge is pretty low). Since half of the cream sauce is made with Greek yogurt you can eat these with out a ton of guilt! Although they taste like you should be feeling super guilty! 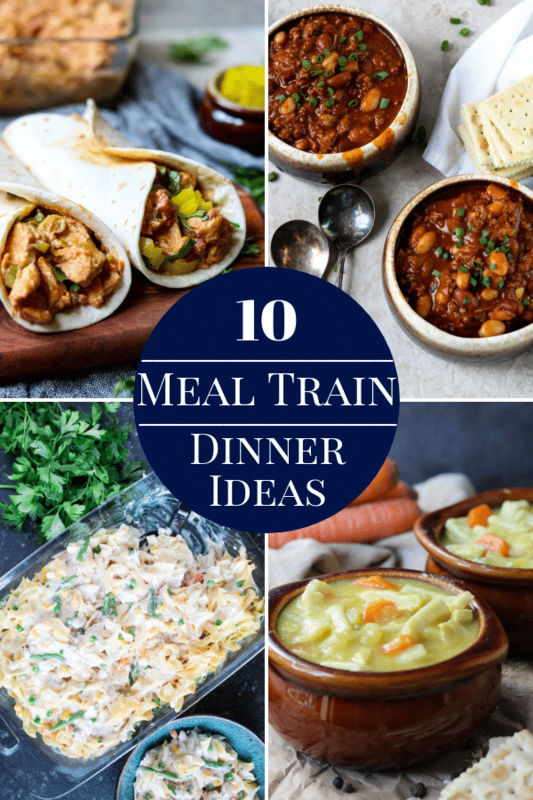 This recipe can be made ahead for busy week meal prep. Simply prepare the chicken mixture, place in an oven safe pan covered with foil. Keep it in the fridge for up to 3 days. When you are ready to have Creamy Chicken Tacos for dinner simply grab it out of the fridge and pop it in the oven for 20 minutes. If you buy a rotisserie chicken at the store you can literally have dinner in the oven in minutes. 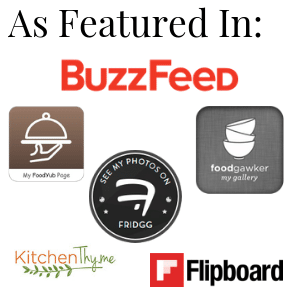 All the other ingredients are easy to find- truly you probably have most of them in your fridge and pantry right now! Which makes it a great option for busy weeknights. My absolute preferred way to prepare chicken for Creamy Chicken Tacos is to not cook the chicken myself! I’ll always take a shortcut, especially if it doesn’t compromise quality! I like to pick up a rotisserie chicken at Costco for $5.00, and I know I am not alone in this. They make a great rotisserie chicken for CHEAP! Thank you, Costco, from all the home cooks across America. Simply place 2 boneless skinless chicken breasts in a pot and cover with enough water to cover the chicken by 1 inch. For this recipe I do not worry about seasoning the water too much, just a teaspoon of salt and some peppercorns is fine. Bring the water to a hard simmer over medium high heat, then reduce the heat to medium low and simmer lightly for 15-18 minutes until the chicken reads 165° on a meat thermometer at its thickest point. Remove the chicken from the water and let it cool until you can handle it for chopping. Or you can let it cool and refrigerate it for up to 3 days. I’m gonna keep this real simple… mix all the ingredients together, place the mixture in an oven safe casserole pan, cover with foil and pop it in a 350° oven for 20 minutes. That’s it. 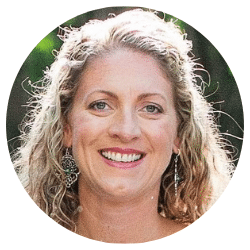 Say it with me…. “Easy”. 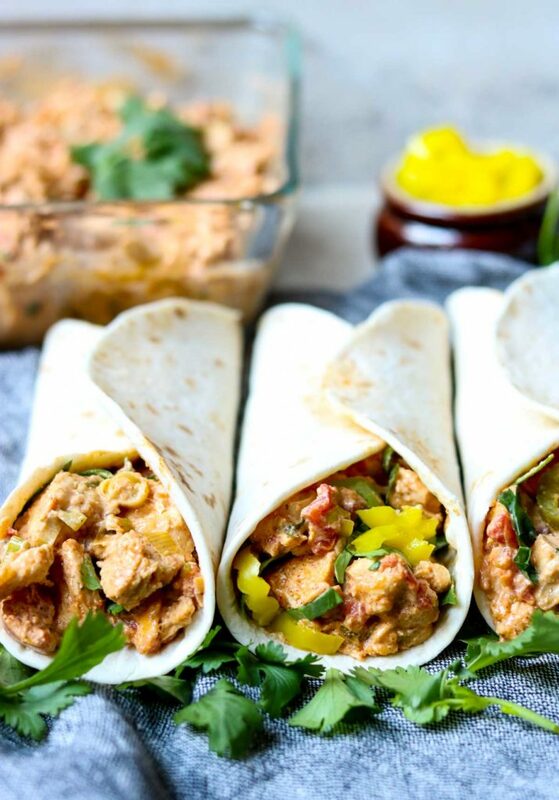 All you have to do now is wrap the warm creamy chicken mixture in a tortilla and pile on your favorite toppings! Add a can of drained black beans or pinto beans to the chicken mixture before it goes into the oven. This should also yield 2-3 more tacos. 1/2 cup of Frozen Fire Roasted Corn would also make a great addition. Mix it in with the chicken before it goes in the oven. If you like a little heat in your Mexican food add some cayenne pepper, red pepper flakes, or a few dashes of hot sauce. To add a smokey flavor stir in a finely chopped chile in adobo, this will also give you a nice amount of heat. A little goes a long way with chiles in adobo. Don’t like any spice or heat? Sub monterey jack, cheddar jack, or cheddar cheese for the pepper jack cheese. If you are not a fan of plain Greek yogurt, sour cream can be subbed in its place. To add a crunch to your tacos add a 5 ounce can of drained and chopped water chestnuts. 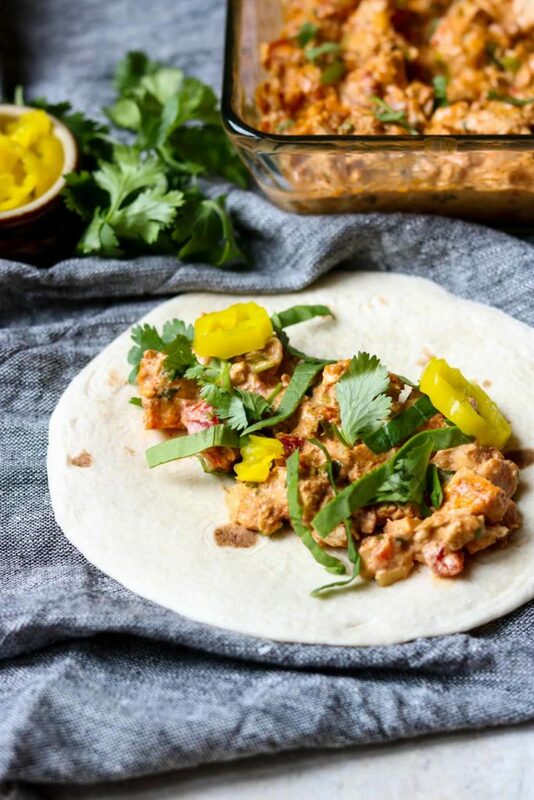 You can really serve these Creamy Chicken Tacos in whatever tortilla you like, or have on hand. I like to use either a soft taco or fajita sized flour tortilla because they are the perfect hand held size. You could also use a whole wheat tortilla or corn tortillas. Although I sometimes find that corn tortillas fall apart easily. A flavored wrap would also work (spinach or sun dried tomato). When I eat Chicken Tacos I like to pile them high with toppings, until they are practically dripping down my arm. Just make sure you serve these with a lot of napkins! Extra Cheese: Pepper Jack, Cheddar, Cotija, Monterey Jack, just to name a few! 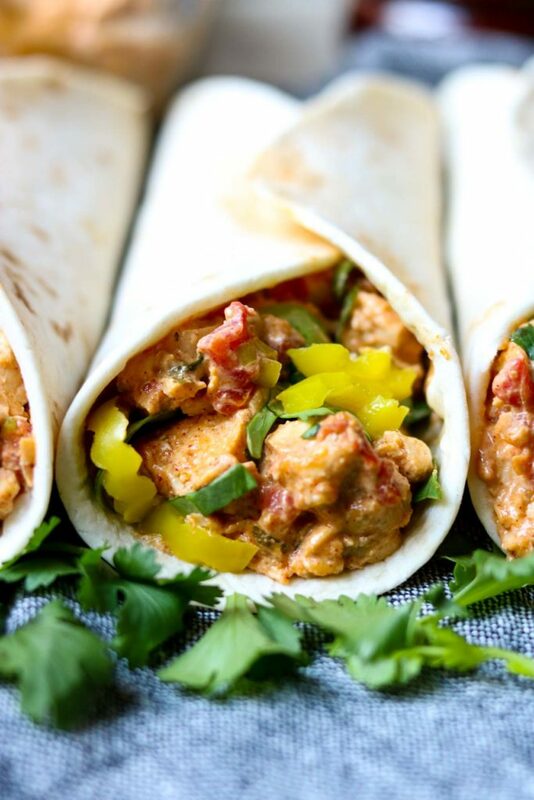 Does your family love this recipe for Creamy Chicken Tacos? Let me know about it! 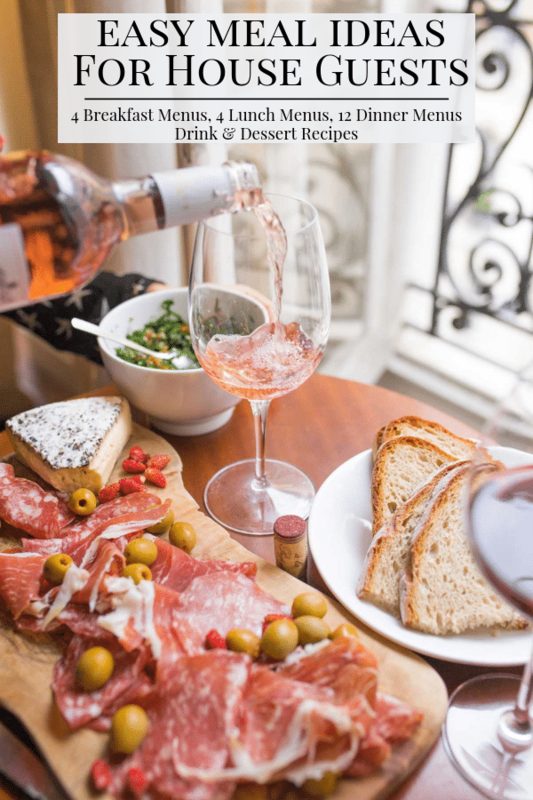 Comment below, rate the recipe, drop me a line, or share it on your social media so your friends can love it too ♥ The buttons at the top of the post make it super easy to share to Facebook, Twitter, or Pinterest! If you share a pic of your creation on Facebook tag me @mom’sdinner or on Instagram @momsdinnerinsta. 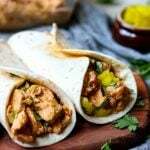 I hope you give this recipe for Creamy Chicken Tacos a try in your kitchen. 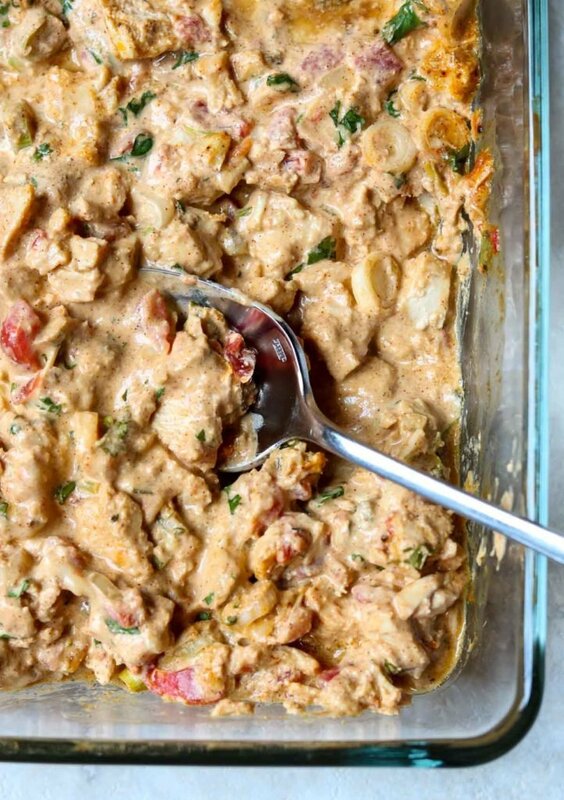 A creamy chicken taco filling that is baked in the oven. Wrap the baked filling in a flour tortilla and garnish with all your favorite taco toppings. 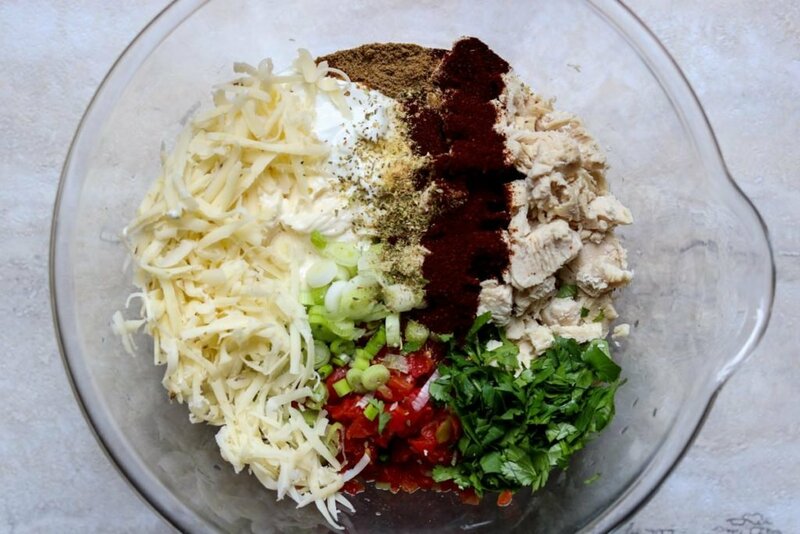 Mix all the ingredients together until they are well combined, place in an 8x8 or 9x9 baking dish. Cover with foil and bake for 20 minutes. 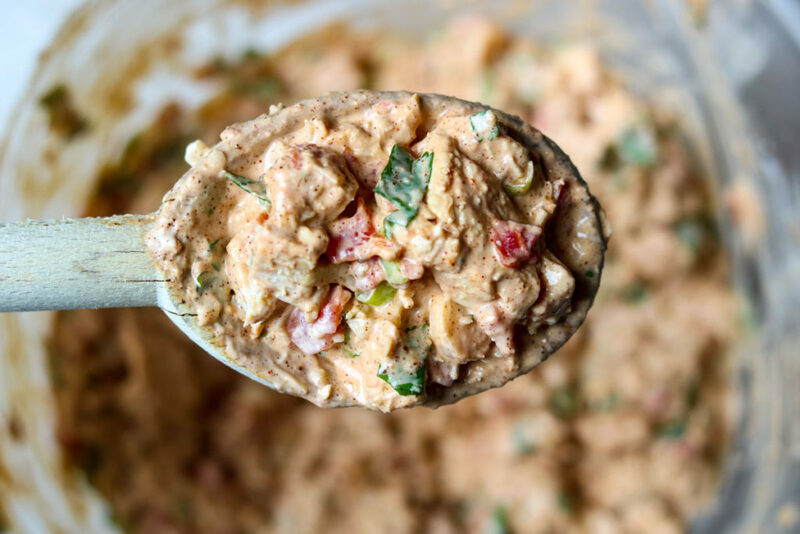 Spoon the desired amount of Creamy Chicken Taco filling into warmed flour tortillas (soft taco or fajita size). Top with your desired taco toppings. I like pickled jalapenos, banana pepper rings, sliced avocado, and shredded lettuce or spinach. Combine all the ingredients and place in an oven safe dish. Cover with foil and place in the fridge for up to 3 days. When you are ready to have Creamy Chicken Tacos for dinner pull it out of the fridge and pop it in a 350 degree oven for 20 minutes. Could this be done in a slow cooker instead of the oven? Thinking of taking this to a school banquet. I think you could definitely make these in the slow cooker. I would cook on low for 1 hour, BUT I would leave the shredded cheese out and then add it and cook for an additional 20 minutes. Also, make sure you use already cooked chicken, not sure how this would do with raw chicken?! This would be a good chip dip too! Looks delicious! Taco night is a favorite for our kids. But I usually hate it because it can make such a mess. I love that this chicken mixture can be made in advance, so there’s practically no mess on busy weeknights! My kids will be so excited when I try it out! Thanks! I agree… traditional tacos can be such a mess. And then one of my kids will bite into the hard taco shell and start crying because the shell cracked in half… dinner time with kids is fun, isn’t it!? HA! This is definitely a winner, winner, chicken dinner! Yum! I can see why this is your new favorite dinner. It sounds incredible. I love the list of possible toppings you included. 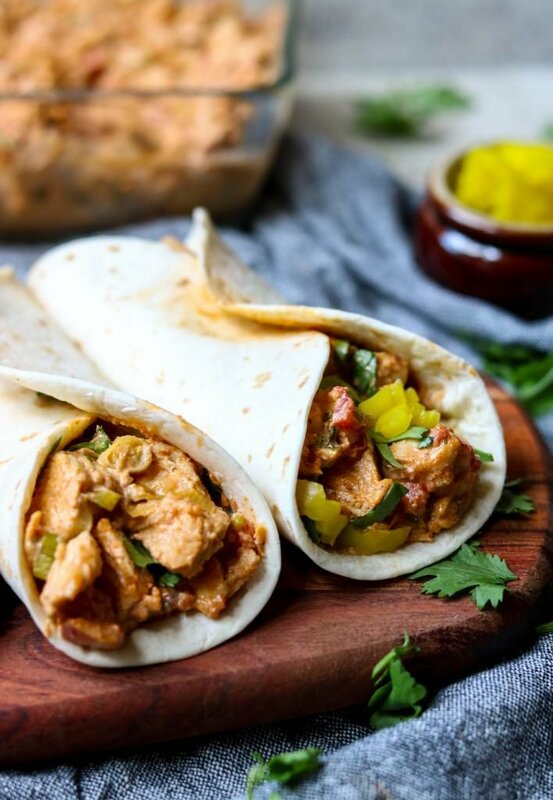 Creamy chicken sounds perfect in a taco I love sauces and this one looks really delicious I would eat these right now if I had it for lunch or even breakfast wow! They are sooo delicious and easy to make! 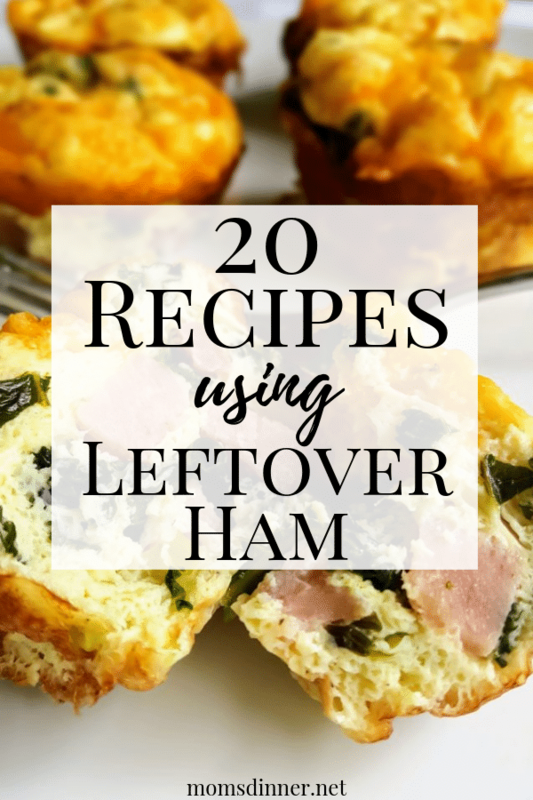 The leftovers are excellent for lunch. I just put a few tablespoons in a tortilla and warm it up in the microwave…..40 seconds to lunch! I’m loving how you’ve used Greek yogurt here! Creamy tacos sound delicious! OMG! These tacos are super delicious! I’m glad it has a nice garlic flavor too! They are SO good! You could certainly add some fresh minced garlic too, for a little stronger garlic flavor. 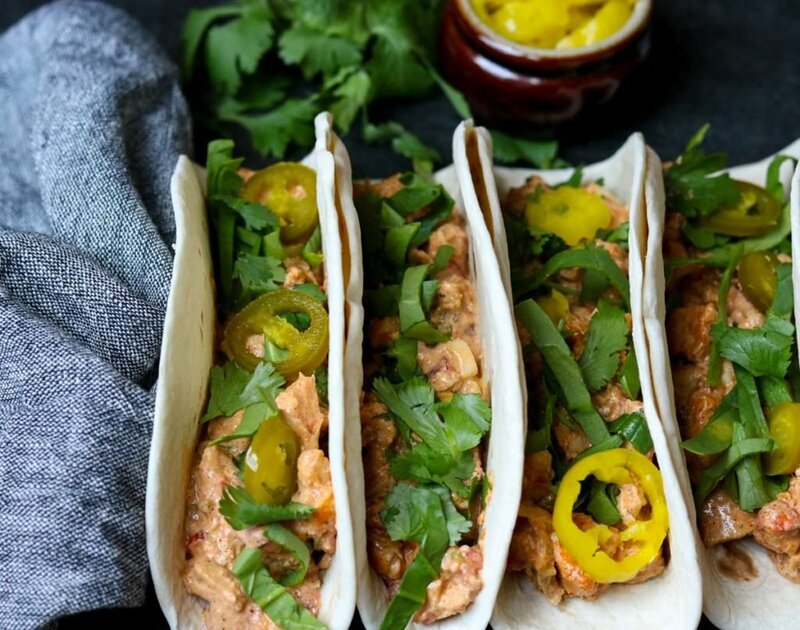 I absolutely love the idea of creamy chicken tacos! Anything creamy is good in my book. And this is so easy, I love it! It is a great twist on traditional hard shell tacos with ground beef…and crazy easy to make!